ABSTRACT: A senior Miniature Schnauzer is treated for acute onset right hind limb paresis with dry needle acupuncture and laser therapy. 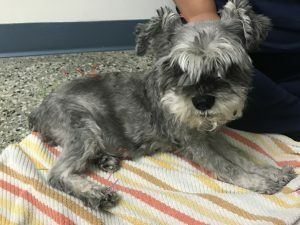 HISTORY: Ziggy, a 14 year old male neutered Miniature Schnauzer, presented for right hind limb paresis of sudden onset. Full workup and referral to neurologist was declined. Ziggy’s regular veterinarian began conservative treatment for Intervertebral Disc Disease (IVDD). Ziggy was started on Carprofen along with Tramadol as needed for pain. An initial laser treatment using a Companion Animal laser was done and confinement was recommended. Recheck two weeks later showed improvement and Ziggy was allowed to slowly increase activity level. The next week, Ziggy returned to his regular veterinarian with a recurrence of paresis, worse than on presentation. Referral to a specialty hospital was declined. Ziggy was then referred to acupuncture therapy. Ziggy also has a past medical history of Diabetes mellitus, seizures, and urolithiasis. PHYSICAL EXAMINATION AND CLINICAL ASSESSMENT: On neurological examination, Ziggy had pelvic limb ataxia. Conscious proprioception was negative in the right hind limb, and decreased in the left hind. He had pain on palpation of the mid-lumbar spine, especially with both dorsoflexion and ventroflexion. He also had significant atrophy of the gluteal and semimembranosus/semitendinosus musculature bilaterally. MEDICAL DECISION MAKING: In Ziggy’s case, I attempted to affect three components of the neurophysiological response: local reflexes, segmental reflexes, and suprasegmental reflexes (Farbas-Babjack). Local reflexes were targeted by causing intramuscular stimulation using dry needling. According to Gunn’s model, myofascial pain can result when a neuropathy causes a nerve and its innervated structures to become supersensitive, thus increasing muscle tone and causing muscle shortening (Cheng). This muscle shortening causes pain directly by pulling on various structures (Cheng). By stimulating the muscle directly, muscle tone decreases and local inflammatory reactions bring increased blood flow to the site, all helping decrease musculoskeletal pain response (Cheng). Segmental and suprasegmental reflexes were affected by using dry needling to stimulate afferent nerve fibers which release local vasoactive substances causing increased local blood flow (Cheng). These afferent nerve fibers also send signals to the dorsal horn of the spinal cord that inhibit the nociceptive pathway at the spinal level (Cheng). Along with each acupuncture treatment, low level laser therapy was also performed to assist in reducing inflammation and neurogenic pain (Hamblin). DIFFERENTIAL DIAGNOSES: Differentials included intervertebral disc disease (IVDD), spinal fracture or luxation, neoplasia of the spinal cord, fibrocartilaginous embolism, and discospondylitis. DEFINITIVE DIAGNOSIS: Further diagnostics were not performed so neoplasia, fracture, and discospondylitis were unable to be definitively ruled out. Diagnosis was presumed to be IVDD due to signalment, presentation, and clinical signs, and treated as such. ACUPUNCTURE TREATMENTS: Ziggy was seen twice weekly. Both dry needling and laser therapy was performed at each visit. Dry needling was performed at Bai Hui (GV20b), GV 20, BL 21, 23, 25, and 27, along with BL 54, GB 29, GB 30, and GB 21, BL 60, and Ba feng points bilaterally. Bai Hui and GV 20 were chosen as relaxation points and for their autonomic neuromodulation properties. Bladder back points (BL 23, 24, 25, 27, and 29) were chosen to affect local musculature and target the areas of pain, with the goal of reducing muscle shortening and reducing local pain. In addition, these bladder points correspond to spinal nerves. The pelvic triad (BL 54, GB 29 and 30) and GB 21 were also chosen for these same reasons, because Ziggy was sensitive to palpation of musculature in these areas. The bafeng points were chosen as distal points in order to stimulate distal digital nerves and their effect on proprioception and proprioceptive reflexes/pathways. BL 60 was chosen for its relationship to the fibular and tibial nerves, and their importance with proprioception and motor control. Laser therapy was performed using a Companion Animal laser using the Acute Pain/Back Injury setting (980nm, 4 watts, alternating between continuous wave, 2 Hz, and 10 Hz). OUTCOMES, DISCUSSIONS: Ziggy’s right hind limb paresis greatly improved over two months of treatment. He began to be increasingly weight bearing and was able to place the limb properly. After significant improvement, Ziggy suffered a set back in which he acutely worsened and his paresis became worse than on presentation. He was unable to ambulate, urinate, or defecate on his own. Due to the severity of his clinical signs, owners elected humane euthanasia. From this case, I learned that alternative modalities such as acupuncture and laser therapy are beneficial, especially when more aggressive treatment such as surgery is not pursued due to finances or other medical concerns. I also learned that despite our best efforts, we may only be able to increase our patient’s comfort for a short amount of time. Cheng, Kwokming James. “Neuroanatomical basis of acupuncture treatment for some common illnesses.” Acupuncture in Medicine 27.2 (2009): 61-64. Cote, Etienne. “Intervertebral Disc Disease.” Clinical Veterinary Advisor: Dogs and Cats. 3rd Edition. St. Louis: Elsevier, 2015. 565-7. Farbas-Babjack, A. “Acupuncture division: aplication of contemporary medical acupuncture as a neuromodulation technique in pain management.” Orthop Div Rev 92 (2004): 37-41. Hamblin, Michael R., and Tatiana N. Demidova. “Mechanisms of low level light therapy.” Proc Spie. Vol. 6140. No. 61001. 2006.